Everyday, birds get injured as a result of human actions. The simple things we take for granted can be extremely hazardous to waterfowl. We thought we'd create a waterfowl safety tips page to alert all animal lovers about the dangers posed by seemingly innocuous everyday objects. 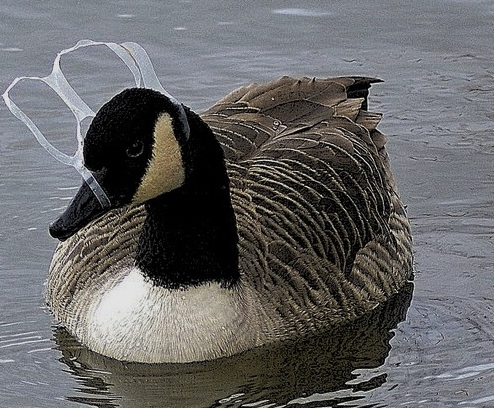 We receive a lot of emails from people who have seen geese with plastic tying their beaks. This is extremely dangerous because it prevents them from feeding. They get their beaks caught in the plastic when they're feeding in the water. Please be sure to cut the plastic so that there are no rings anywhere before you discard or recycle it. 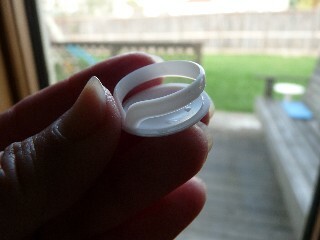 PLASTIC OR METAL PULL TAB RINGS OR ANY PLASTIC RINGS FROM THE TOPS OF CONTAINERS. While feeding in lakes and ponds, waterfowl may choke upon these rings. Once, we tried in vain to rescue a duckling who had somehow got his bill entangled in the ring. One part of the ring ended up around his little head and the other around the middle of his bill so that he was unable to feed. Aluminum pull tab rings and larger plastic rings from the tops of containers are a hazard to larger waterfowl. The staff at Tingley Beach in Albuquerque tried in vain to capture a grown Canada goose who had one of the larger plastic rings lodged around his bill, preventing him from feeding. All you have to do is cut off about one inch of the ring so that it's no longer a ring and cut the remaining ring from the tab so that it's not connected to the tab before discarding into your trash bin. Cut plastic soda can holders apart so there are no holes. Do not throw cigarette butts on the ground, dispose of them properly. Pick up litter, even if it is not yours. This is your Mother Earth, save her. Make sure you do not pour chemicals in sewers or on land; dispose of them properly. You may also want to look into environmentally safe products like Ecover. Balloons can kill. Cut up used balloons and dispose of properly. Avoid balloon releases. Do not use monofilament fishing line. If you must, take it home with you and cut it into small pieces. Fishing hooks can gouge, take fishing hooks home. Do not throw your trash/litter anywhere except the trash can. Recycle paper, glass and cans. This will keep it from becoming litter and help the environment as well. Cut the tops off tin cans, place the top in the can and smash them flat and recycle. Plastic bags can suffocate and choke. Tie knots in them. Broken glass can kill, recycle the glass.